I make my home on the San Francisco Peninsula - on the crust of Silicon Valley. Here, where orchards and oak trees once mingled, houses shoulder together, the occasional hedge and obligatory fence dividing the land. We bought our current home four years ago - lured by the large empty yard full of possibility. The "back 40" boasted a few neglected fruit trees - fig, apple and prune. The side yard was a patchwork of juniper trees and English ivy and the front yard was overly manicured, cookie cutter greenery. I embraced the blank slate, but bemoaned the lack of life in my new home. Pollinators were few and far between. Occasionally, a sole scrub jay would stop by the property and rats ran rampant in the ivy but, otherwise, the only life here was ours. It was lonely. Four years later, we have had nearly 40 different species of birds visit our yard. About 2/3s of those are regular visitors and at least four species of birds - Juncos, chickadees, titmice and wrens - nested in our backyard just this year. Chickadees had a brood of 4 babies whose rubber duckie-like squeaks filled the backyard. Opening up my garden to wildlife has been enjoyable, enriching and makes just the smallest dent in habitat loss animals are experiencing though out the globe. It was neither expensive nor time-consuming. Yet this transformation worth every cent and hour spent. Family from rural areas visit and are awed by the variety and number of birds our yard hosts. My sons and husband have turned into ardent bird watchers. And my blood pressure drops every time I step outside to a chorus of birdsong. 1) Just Add Water. We have far more birds come to our birdbaths than to our two feeders or elsewhere in the yard. Last weekend, we came home a hawk in one of the birdbaths. In this packed suburban neighborhood, we've had orioles and grosbeaks, warblers, Spotted Towhees and woodpeckers. Everybody loves a good drink or bath. Resident finches have a party in the birdbath. There are only a few rules about water for wildlife. Keep it clean and keep it full. An overhanging tree or tall shrub that the birds can fly up is much appreciated. Place at least one of your birdbaths within view from a common room in the house. That way you can enjoy all the activity! Migrating robins find a watering hole. 2) Let Fallen Leaves Lie (or Bring Them In). Refraining from raking leaves out of the beds and/or adding leaves collected from elsewhere into the beds was one of the most effective ways we have boosted the biodiversity of our yard. Not to mention that it was free!!! digging through 3 years worth of leaf litter. Leaves add mulch and nutrients to the soil. Bugs help decompose the leaves. And the birds scavenge the leaf litter, looking for tasty morsels. The only problem with leaf litter is that I cannot seem to get enough of it! Leaves used instead of traditional mulch in this native garden (not mine). 3) Assess Your Existing Plants and Trees. 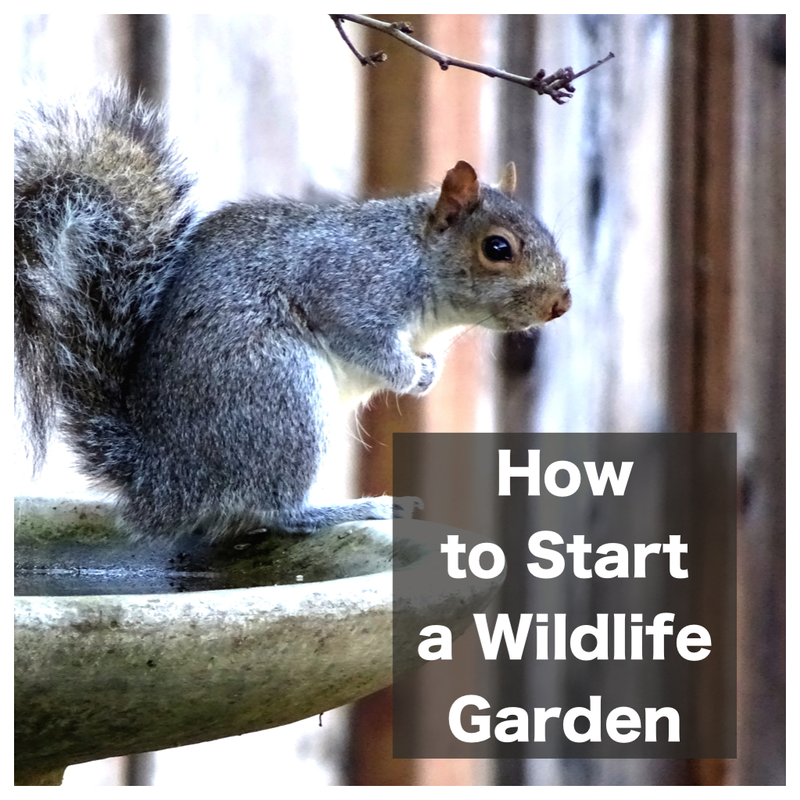 You don't need to rip everything out of your yard to make it more wildlife friendly. Look around to see if wildlife are using any of the plants you currently have. For instance, we opted to keep four unsightly Hollywood juniper trees. They are not native but they are evergreen and mature. They provide privacy from the neighbors, nesting space for the birds (I think there is a goldfinch nest up there), and juniper berries. I never realized the last one until a flock of cedar waxwings descended on the trees this spring. Similarly, camellias offer little wildlife value in general but they are evergreen and provide cover. An Anna's hummingbird enjoys the existing bottlebrush bush in January, when little else is in bloom. Bewick's wrens and other small birds use the non-native blackberry for safety and scouting. 4) Plant Natives. Native plants and local wildlife have co-evolved together for thousands of years. Insects eat the plants (actually a good thing!). Parents feed the insects to their baby birds. And the cycle continues. A just-fledged Dark eyed Junco. The good news is that you do not need to plant all natives all right now! I've underplanted our junipers and camellias with evergreen natives. When the natives are big enough, I'll remove the non-natives. Another tactic is to focus on certain beds. I have left the Home Depot-ish front yard mostly intact - replacing only two beds with natives. As they grow and I save up money, I will redo the rest. Same goes for the side yard. We pulled out the ivy and replaced it with slowly natives and a couple of wildlife-friendly non-natives as time and money permitted. Deer enjoy the shade of the existing Japanese maples and mostly leave the newly planted natives alone. A Grosbeak uses the Hawthorne as cover before dipping into the birdbath. 5) Be Patient. All the bird nests in our yard this year are along a single fence wall. It might be the exposure but I have had the birdhouses up there for years though without a single taker. More likely, the burgeoning hedge of native shrubs - planted three years ago - are finally big enough to offer real cover. The titmice nested in this birdhouse, covered by native Ceanothus. 6) Put In a Wildflower Meadow. Wildflowers answer the impatient gardener's prayers. Packages of seeds sown in the fall provide cover in winter, bloom in spring and reseed themselves for next year's meadow. Beneficial insects overwinter, pollinators buzz, and birds handle the clean up - of bugs and seed heads left to dry. A Junco perches on some Clarkia wildflowers that reseeded from last year's seed packet. I often plant wildflowers in out of the way spaces with no irrigation. I let rain do the watering and don't bother to clean up in the spring. Another option that worked well for me was to plant wildflowers as a cover crop to my pumpkin/bean patch. As the wildflowers are dying, it is time to tuck in the squash seeds. Cheap and effective! 7) Keep Cats Out of the Garden. Before I realized the ecological impact of outdoor cats, I let my kitty wander. I thought he spent his time sunning himself until I saw him efficiently catch a bird that had dropped into the birdbath. Apparently, the average outdoor cat kills over a dozen birds a year - most of which the owner does not see. After the birdbath incident, my outdoor cat became an indoor cat. I worried less about him getting hit by a car, stuck under the house when we had work done (it did happen! ), eaten by a mountain lion, and so on. We have two bird feeders on our property - both placed by windows. Our two cats enjoy - but do not participate in - the activity. Everyone has adjusted and is happy - especially the birds. 8) Kick Out Chemicals. Last, but certainly not least, you cannot have a wildlife garden without ditching pesticides and herbicides. Using those in a garden eliminates baby bird food, endangers pollinators and is simply not necessary. I do see insect damage - regularly - on my native plants. That is a good sign. It means that something is using them. Knock on wood but I have never had a native plant killed by insect damage. They work hand in hand, it seems, the plant growing too fast for the nibbles to do real damage. We have paved too much of our land. Broken it into parcels. Set up strip malls and parking lots. Habitat loss is number one cause of species decline but we can stem that loss. We need to stop further development. We also need to start replacing what has been lost. We need to stitch back together a patchwork to give the insects, the birds, the small mammals a toehold on this changing planet. I recently read that 5 yards in a city block is a sufficient pollinator corridor. That - and the transformation of my own garden - gives me hope. 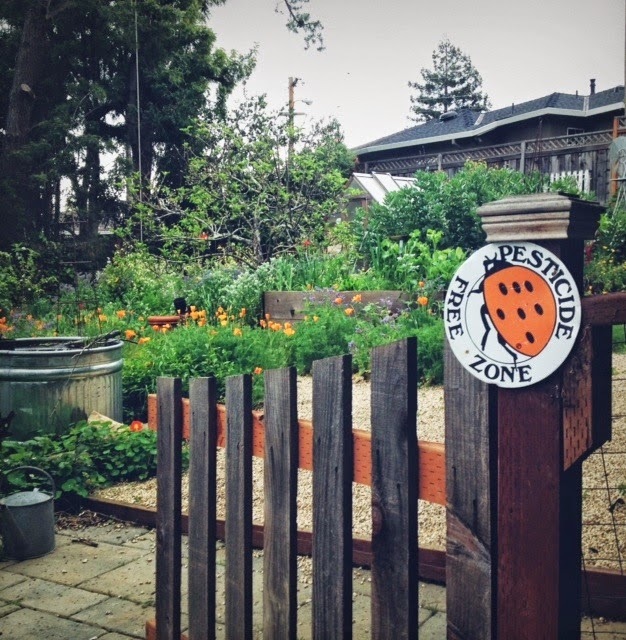 This post is part of the Tuesday Garden Party, Homestead Barn Hop and Green Thumb Thursday. This is awesome, what a beautiful spot you have. I moved to an area that has a lot of trees and it's amazing how many more birds I see and hear. Love it! @deb: I can just picture the woodpecker on the bird bell. Honestly, those are some of my favorite birds. I mostly keep our peanut feeder up because it is how I see the most woodpeckers. @Lindsay: Trees much such a difference! We have no real mature trees in our yard (though I hope to change that!). Enjoy your birds. What a gorgeous garden! Thanks for the reminder that I need to replenish my bird feeder. Inspirational as always! I have neither the time nor resources to set up a wildlife habitat, but will keep native plants and this post in my mind every time I need to make a change/ choice about landscaping. Love the bird bath idea! What about standing water/ mosquito issues??? @Lori - Thanks so much! @Betsy - Definitely go for a bird bath! I have 5. Two I picked up at garage/estate sales. Another bird bath is simply a plant saucer sitting on an upturned pot. Like this but not as fancy: http://www.pinterest.com/pin/562387072187617780/ Standing water/mosquitos is no issue for bird baths because the water is so shallow. It either gets splashed out by birds or dried up by the sun. Only thing is to remember to fill it up. In this drought, I've been using water from washing vegetables (organic) to fill my most used bird baths. This is a great post! I love what you've done with your yard! I've chosen this post as my feature for Green Thumb Thursday. Stop back over and grab a featured button for your blog. Thanks for sharing! I am envious :-) Thank you for sharing on Green Thumb Thursday and congratulations on being featured by my co-host, Lisa. @Lisa: Wow, thank you so much for featuring my blog! I am honored! @Jessica: Thank you, Jessica. Much appreciation. So fantastic! (standing ovation here) Great post. Great tips. The best thing we did for our backyard was build a natural pond. The birds love it. I love the nesting boxes you have along the fence -- we might have to imitate that. @Aneela - Ohhh, I desperately want to add a pond to our garden. I have seen and heard amazing wildlife encounters around backyard ponds. It is on our "to do" list.